Beautiful day! 20C, sunny skies, fall colours, how can you ask for anything more? Muskoka was a beautiful backdrop for this race. We were doing the 18km canoe race in our 18 foot Jensen-style canoe. 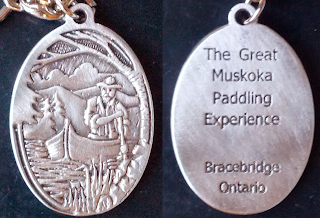 The race started at the foot of Bracebridge Falls in the town of Bracebridge Ontario, using the Muskoka River. The kayaks started first, the canoes one minute behind. We lined up and from the start we noticed we were going to be in tough! Everyone else had carbon paddles and super rigged out boats, we were the only ones rocking wood paddles in the 18km. Serious crowd! We might have been more competitive in the 10km, but there were some pretty hard-core folks in that one too, so who knows. Race starts and we find ourselves in last. There's a sinking feeling (so to speak) as you watch other boats leave you in their wake! But our goal was to experience, learn and enjoy, compete with who we could. Soon after the start we were passed by the two "North Canoe" boats... these are giant boats with crews of 6+ people on them - they can really move! Finally we managed to catch up on a few of the kayaks, so started to feel a little better. Some of the canoes that had left us in the dust started to come back to us as well, or at the very least we weren't losing more ground. We just kept paddling, hoping to keep catching folks as the race went on. 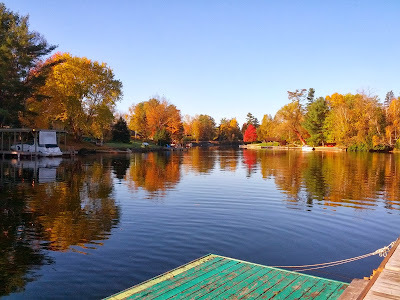 We finally emerged from the Muskoka River and into Lake Muskoka for what was to be a quick run around the islands, then back up the river. But... it was not at all clear which way to go! The glut of boats we had been chasing went straight out into the lake, but perpendicular to where the island actually was. During the briefing they implied the rescue boat would be there to guide us, but it was way over by the islands (and it wasn't clear that it was the right boat from afar!). In the end it didn't trouble us too much, and actually allowed us to catch up to the glut of boats we'd been chasing. Shortly after, there was more confusion - were we supposed to turn left or right? (near the top of the map). My partner correctly said "we are supposed to go around 3 islands" so we guessed left, correctly. But again, the lead boats in our group went the wrong way a bit and had to double back. 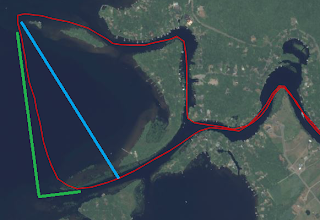 The rest of the race was back in the Muskoka River, now heading up-stream. This was tough at times but the dangling carrot of boats in front of us kept us motivated. We passed one kayak, but there was a white canoe just ahead of us that we really really really wanted to catch. They were so close most of the way up the river, at one point we were right in their wake... but when we pulled out to pass we just couldn't do it. Eventually we got caught up in some traffic (10km racers on their return leg) and they took off on us. A bit later the kayak we'd passed last caught back up to us and passed us. Since they started 1 minute ahead of us, we figured we just had to keep him and the other kayak within sight to beat their time. It's apples to oranges anyway, kayaks and canoes are much different beasts! But just something to shoot for. In the end that worked out OK. Cool keychain as a momento! 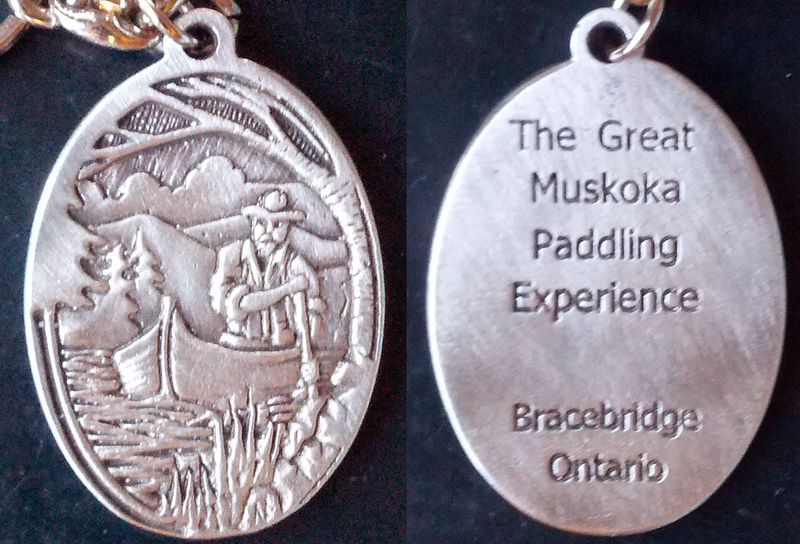 Great "Experience", beautiful river setting, amazing volunteers and competitors, just a fantastic day all around. The weather was the piece de resistance. Only small complaints it the lack of clarity on where the course went once we hit the lake, but if we'd done our due diligence with the map beforehand that shouldn't have been a problem... and ultimately didn't cost us that much time. It is funny that at Logs Rocks & Steel we were the top canoe with some of the best equipment, then we come to a canoe race and we're the bottom canoe with some of the worst! There's a whole other level of excellence people who dedicate themselves to something can achieve compared to those who dabble.